There are 29 stocked lakes in the Upper Copper/Upper Susitna area offering a unique blend of freshwater fishing opportunities to sport anglers. The lakes are stocked with Arctic grayling, rainbow trout, coho salmon and Arctic char. 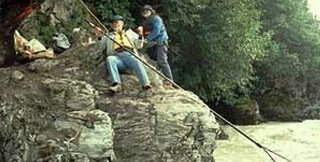 In the Upper Copper/Upper Susitna Management Area sport anglers, personal use dip netters, and subsistence users commonly fish for Chinook (king) salmon, coho (silver) salmon, sockeye (red) salmon, Arctic grayling, burbot, Dolly Varden, rainbow and steelhead trout, and lake trout. Smaller fisheries occur on the area’s resident stocks of whitefish. The following links lead to regulation summaries of Alaska sport and personal use fishing regulations published by the Division of Sport Fish as a service to anglers. They are not intended to be a complete digest of all fishing regulations. Regulations may be changed by the Alaska Board of Fisheries during its regular meetings, by emergency regulation, or by emergency order at any time. Any changes to the regulations are made available through the emergency order link below.